Yes, another blog about bike racing. I keep meaning to get to other things but races keep happening and the over-excitement must be channelled somewhere. 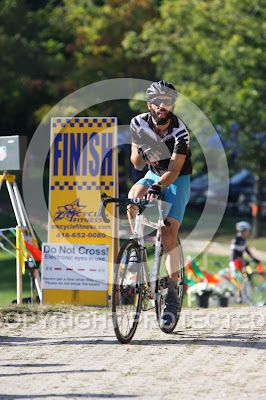 This mildly rediculous photo documents the final moments of my day out at the Southern Ontario 'Cross Series best attended race to date, ZM's 'Turkey Cross', just over a week ago in this very town I live in. The sun shone on a lovely Fall day, the course was fast yet challenging, and I rolled and hurdled through it without troubles. It was the largest field yet for my category, a whopping 41 riders; I ripped my way to 5th place, trying to pull back the same Mr Cyclossimo for all of the last two laps (15 minutes or so). I got quite close in the last lap, but then he pulled away again in a hairpin turn and I could not pull him back. I just couldn't figure it out - where was the speed I needed? I felt good enough, yet the momentum just wasn't coming through the bike. Mr C. didn't seem that fast, just grinding away in a low gear. At home, all became clear at last: my chain had been bone-dry the whole time! I'd made this incredible decision to not properly clean the chain/drivetrain, and then wiped it down just before leaving the house. End result - no lube at all. Which is a real handicap. Saturday morning rose fresh and cool and I off I went by commuter train - once I'd chased it down at Union Station after watching in the darkness as it rolled right through my stop. I de-trained and, riding through the wide roads of Whitby, Ontario I found myself in the 5 degree C cold of Heber Down Conservation Area with nowhere to go inside and warm up, and was reduced to riding in circles in a patch of sunshine attempting to get warm with ninety minutes to go till my race. Finally I managed a good semblance of warmth, took fourth wheel off the out-and-back opening lap on asphalt, and settled in to a properly twisty, yet flowing course. The grass was still soaking from the dew, making things a bit technical but not overly. Wetter still was the muddy water-crossing, which became deeper and muckier throughout the race. I found myself in a real 'cross race for once, legs and face covered in mud, shoes getting harder and harder to clip into pedals. Dudes kept passing me, despite my good cardio - none of my usual threshold heart-rate panting-like-a-dog yet it didn't matter. So what then? This week's minor fiasco turned out to be my seatpost - it sank a good three inches into the frame, having been too low from the gun. As the bike got progressively smaller, I got slower. Eventually I realized afterward that my right-side pedal had gotten damaged on one side, making clipping in an extra challenge on top of the muck itself. End result of what was actually a blast of a fun race: another 5th place, but an utterly dodgy one due to the complete lack of finish line technology - no camera, no actual line on the ground, no sensor of any kind. Just two guys with a notepad, reading numbers off backsides. Unsurprizingly, somebody got placed as lapped when apparently (according to him) he finished ahead of me. We compared notes and it did seem clear that he passed me mid-race. A protest was made, but what recourse did the commissaires have? Tire tracks on the grass? It was really the only bad note of the whole day - Mill Street showed up with free beers for racers, and there were no tickets either! Organic microbrews at the end of a 'cross race, in sunshine, in a country wood - it doesn't get better than that. I set up on a picnic table on the sandbar by a stream and commenced highly vocal encouragement of anyone willing to ride the whole hillock-to-sandbar-to-singletrack-to footbridge section, which a number did do, to my great satisfaction. That is la grinta.